CBS Houston reports that the boy’s pediatrician reported his injuries to police; TMZ has published photos that it claims are of the child’s injuries; and Peterson cooperated with police, saying that he’d disciplined his son with a “whooping” and, when the event happened in May, texted the child’s mother, who lives in Minnesota, saying he felt bad for overdoing it. 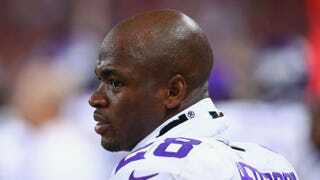 By way of an initial defense, Peterson’s attorney issued a public statement stating that the former league MVP is a loving father who merely disciplined his son by using an approach that had been administered to him as a child. And while, clearly, no one condones child abuse, if Peterson’s statements are to be believed, he seems to love his child. But parenting practices vary widely, and his are being judged by a media and public not known for being skilled in analyzing issues complicated by race, gender, culture or potential implicit (unconscious) racial bias, which most Americans have. These all come into play when determining whether Peterson’s actions went beyond community standards for disciplining his child. If the TMZ photographs are, in fact, of his son, Peterson may have crossed over a line. But both the community standards around appropriate discipline and the requirements of professionals required to report suspected child abuse or neglect (pdf) are not as cut-and-dried as one might assume, so we shouldn’t rush to judgment. Almost all American parents have used corporal punishment. In 2012, 77 percent of men and 64 percent of women reported that they believed “a good, hard spanking” was sometimes necessary. In general, the parents of boys or black children, Southerners, younger and poorer moms, and evangelical and conservative Protestants are more likely to spank. “Many of us were spanked with implements, and it was good for us. Many of us were abused with words, and we were forever scarred. The question is, what is the time and tenor of the house?” says the Rev. Dr. Alyn Waller, a family and marital counselor and head of a Philadelphia mega-church. Some experts trace African-American reliance upon corporal punishment as a vestige of slavery. What’s more, many fathers raise their sons using authoritarian parenting practices (which can include corporal punishment). Black fathers often physically discipline their sons to instill behavioral control and to prepare their sons for a society that will surveil them and not be forgiving when it comes to any youthful transgressions. “I’m fairly sure Adrian Peterson’s intent, from what I can see at this point, was not an evil one. He texted his concerns and his ambivalence, and he made it public,” says Brewster, who worries about both a “witch hunt” and potential criminal-justice fallout. According to a Sports Illustrated legal analysis, if convicted, Peterson could face punishment ranging from 180 days to 10 years in prison. Philadelphia-based writer Hilary Beard is co-author of Promises Kept: Raising Black Boys to Succeed in School and in Life and Health First! The Black Woman’s Wellness Guide, both of which have won an NAACP Image Award. Follow her on Twitter and Facebook.